BUC's USED BOAT PRICE GUIDES, a.k.a. 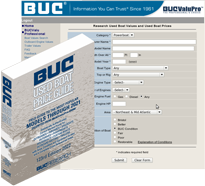 "The BUC Book", has been the used boat pricing "bible" for the boating industry since 1961. It has become the standard reference for current market values of used pleasure boats, motors and trailers of all types and sizes. Using advanced econometric forecasting techniques, BUC's industry experts derive accurate prices from the correlation of numerous dealer, broker, surveyor and manufacturer reports. BUCValu Professional is a subscription-based boat evaluation service providing accurate boat, engine & trailer market values to professionals in the marine industry. Use BUC's Personalized Evaluation Service(PES) to obtain a complete, accurate and customized evaluation of your boat or yacht. Find out more about BUC and our complete line of marine industry tools and services. © 2019 BUC International Corp. All Rights Reserved.